Brighton & Hove Albion's under-18 team will bid to reach the quarter-finals of the FA Youth Cup for just the second time in the club's history this evening. The Seagulls travel to Goodison Park to play Everton in the fifth round tie, which kicks off at 7pm. Albion fans will be able to watch the game on the club's YouTube channel. 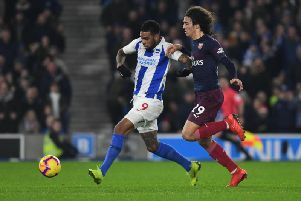 A Brighton win would see the club reach the last eight for the first time since 2006 and Albion's joint under-18 coach Mark Beard said: “If we get into the quarter finals, then it will be just the second time the club has got that far, so there’s a bit of history involved for us. “Goodison Park is an unbelievable stadium and an historic ground. The boys have never played there before, so it will be a great challenge. “Every game has been hard so far, we’ve had West Ham United, Man United and now Everton, but this is a great game for us as managers and coaches to stick our teeth into. The winners of tonight's game will play West Brom in the quarter-finals and Brighton striker Danny Cashman said: “We know who we could face next, and we’ve had one of the hardest draws so far in this competition. “In a way that’s a good thing, we’ll be the underdogs again and people won’t be looking at us to win, but we will and we all believe in our ability as a group.